Wow! What a beauty this gorgeously patterned butterfly is! How wonderful to be able to capture a dozen close-up shots of it with my compact camera Canon Powershot A60, and to continue delighting in all its fabulous images on my personal computer as and when I desire, details impossible to admire otherwise. This impressively large butterfly has a ‘tail’ and a wingspan of 11-12 cm. It is beautifully clothed in some shades of brown on the upperside, whilst the under surface is ‘designed’ with broad bands in varying shades of reddish or cinnamon brown and interspersed with narrower off-white bands. Each hind wing has two large submarginal ocelli (eye-spots). 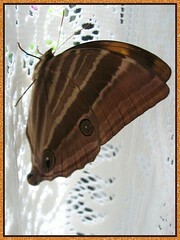 This tropical butterfly is crepuscular in habit, active during dusk and often enters lighted houses. Yippee! Count us as one of the blessed ones to have the pleasure of this beauty visiting our home last December! ;) Butterflies are such welcome visitors to our garden. And now to have one in our home is simply marvelous too! This Indian Palm King surprised us one late evening by flying into our lighted house, probably from one of the palms growing in our garden and attached itself on the ceiling of our dining hall. Past midnight, it was still there when the dining lights were switched off! Foodplants: Include Arecacea (Palm family) especially coconut palm, Bignoniaceae, Fabaceae, etc. Distribution: India to Myanmar, Thailand, Indo-China, Malaysia, Singapore, Sundaland, Sulawesi and Philippines.